Benjamin Franklin: inventor, scientist, author, printer, politician. The list of occupations to describe one of the United States most beloved founding fathers can seemingly stretch on forever. However, one will be surprised to see the title “slave owner” tacked on to the end of Mr. Franklin’s powerful name. The topic of slavery involving the Founding Fathers of the United States can be somewhat complex. Slavery was seen by most as an essential and unavoidable practice in order for the colonists to survive and thrive in their new land. Therefore, many Founding Fathers owned slaves including: Thomas Jefferson, James Madison and the great George Washington, even if they themselves felt the idea was wrong. This unavoidable piece of American history brings us to our featured Founding Father: Benjamin Franklin and his involvement in the practice and abolition of slavery. The Pennsylvania Gazette was Benjamin Franklin’s most popular newspaper and was printed out of his offices in Philadelphia. While in production, Franklin would run local advice columns, schedules of arriving and departing ships, and advertisements for other local businesses. Among the harmless advertisements of cloth and tobacco were sections devoted to ads for runaway slaves and slaves waiting to be sold. Franklin also printed a series of Quaker pamphlets condemning slavery. Benjamin Franklin had purchased a number of slaves to work in his home in Philadelphia. Some of his slaves included a couple, Peter and Jemima, their son Othello and John, who accompanied Franklin on overseas journeys. In letters to his wife, Deborah, Franklin often praised the loyalty and competence of his slaves. Even during his time as a slave owner, Franklin showed a glimpse of compassion toward the enslaved individuals. While on a trip to England to visit his son William, Franklin learned that one of his son’s slaves, King, had runaway and was being taught to read and play music by a woman living in the nearby Suffolk. Rather than attempting to recapture the man, Franklin convinced his son to let King stay with the woman until she was ready to part with him. In 1787, Franklin had finally decided to join the abolitionist movement in Pennsylvania. In that time, he had become President of the newly reestablished Pennsylvania Society for Promoting the Abolition of Slavery, which was a predominantly Quaker organization. It is at this point that I should mention the controversial relationship Franklin had with the Quaker religion. In the height of the American Revolutionary War, Franklin was serving as commissioner to France. Franklin spent a large portion of the war in France sending support by way of shipments of French goods to the fighting colonists. When not sending shipments in favor of the colonists, Franklin worked to strengthen relations with the French monarchy in exchange for support against the British. In order to gain the respect of the French people who were heavily influenced by moral tenants of Voltaire and others. Franklin presented himself as a “Quaker philosopher”, though many historians would classify him as quasi-Quaker or even anti-Quaker. Others provide the argument of the changing Quaker values and traditions and that Franklin was simply following an alternate version of Quakerism. 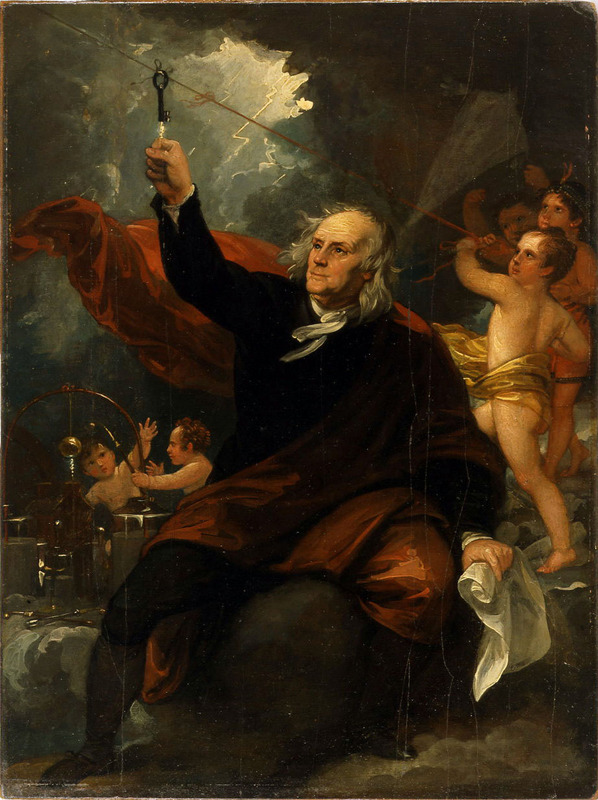 There is also much debate over Franklin’s religious beliefs in general, having been “religiously educated as a Presbyterian”, Franklin never fully embraced all aspects of religion. 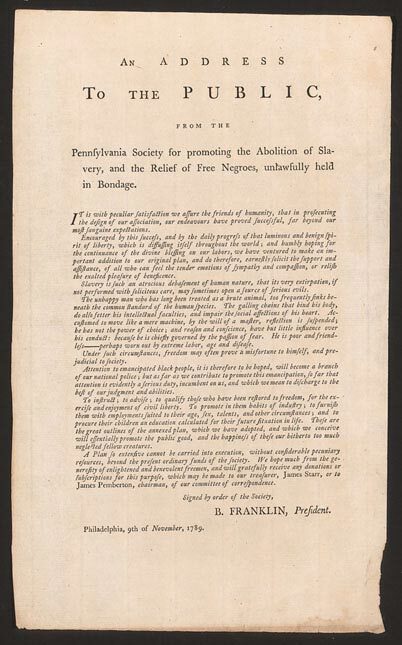 Despite the rumors surrounding Franklin and the Quakers, Franklin helped passed legislation on the abolition of slavery in Pennsylvania and the rest of the country Three years after his appointment to President of the PA Society for Promoting the Abolition of Slavery in 1790, Franklin signed a petition entitled, “Petition for the Abolition of Slavery” and presented it to the United States Congress. The main points of the petition aimed at equality in terms of creation and the newly established American freedom and opportunity to condemn slavery, comparing slavery to the seemingly inescapable stranglehold the British Empire placed upon the colonies. However, the Constitution that limitations on the topic of slave trade could not be passed in Congress until after the year 1808, so the petition was set aside. The influence for Franklin’s change of heart on slavery is difficult to pinpoint. Some sources suggest that he embraced the ideals of England and France when dealing with slavery. Franklin spent many years traveling between Europe and the United States as an ambassador. Franklin’s near full commitment to religion, whether for political or moral gain should be considered. Others believe that Franklin may have been having an affair with one of his female slaves while he was still married to his wife Deborah. This could also possibly explain a reason for Mr. and Mrs. Franklin to have little to no contact during the last 10 years of their marriage. Unfortunately for Franklin, he would never live to see his dream of emancipation come alive. Benjamin Franklin died a mere two months after the submission of his petition at the age of 84. The actions of the past and the influence to change seem minuscule when focusing on the great attempts Franklin made toward the abolition of slavery. United States citizens past, present and future should be ever grateful for his long-life and hard-work.